The Los Angeles Times has reported that legendary film producer Richard D. Zanuck died of a heart attack earlier today. He was 77. His long career included numerous critical and commercial hits, including Jaws, The Road to Perdition and Driving Miss Daisy, for which he won an Oscar. Over the past decade he enjoyed a particularly rewarding collaboration with director Tim Burton, which lasted through to the recent Dark Shadows feature film, his final completed project. Our condolences go out to Richard's family and friends. 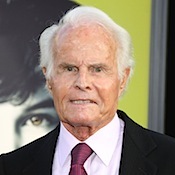 Heartfelt condolences to the Richard D. Zanuck Family. What a legendary Titan Producer/Director Mr. R.D. Zanuck was. His Co-masterpieces lives on!! Wow, JAWS, DARK SHADOWS, etc.,.